In my previous post I introduced the architecture of message bus based system, the dispatcher mode and the pulling mode. I also explained a bit about the channel mode and transport extensibility of WCF. And then, in order to make the following sample simple and easy to use I created an in process and in memory message bus. In this post, I will demonstrate how to create a WCF transport extension over this memory message bus, for the most common MEP – Request Reply mode. Before we go to the implementation, let recap the WCF transport mode. The figure above shows the classes that introduced for the request-reply MEP. First of all, we need a dedicate binding for this transport. As I said in the previous post, the binding takes the responsible for creating and adding all necessary binding elements into the channel stack. There could be many binding elements in the stack but the encoding and transport are mandatory. The encoding binding element defines how the message should be serialized and deserialized. And the transport binding element must be the last on in the stack. As I mentioned, we can leverage the WCF build-in CustomBinding, but for a fully example I will create our own binding in this series. The transport binging element is the root of our transport extension, it takes the responsible to create all following stuff and pass all necessary information into the next level. 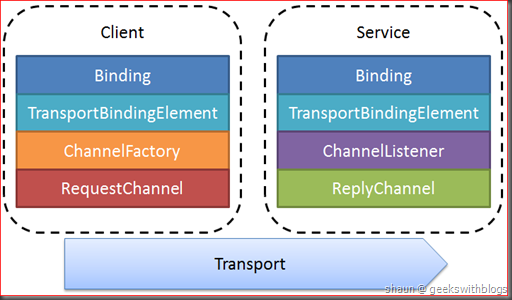 Based on the service or client side, transport binding element will create the instance of channel factory and the channel listener. The binding and transport binding element will be used on both client and server side. On the client side, the channel factory will be used to check if the MEP is support by this transport. And if applicable, it will create the related channel. For example, if the current MEP is request-reply and is supported, then the channel factory will create a request channel. How many EMPs the transport can support is based on us. That’s to say, we defines which MEP can be supported by our transport. It’s no need to support all MEPs in a transport. For example, the basic HTTP transport doesn’t support duplex MEP, the MSMQ transport only support datagram MEP. 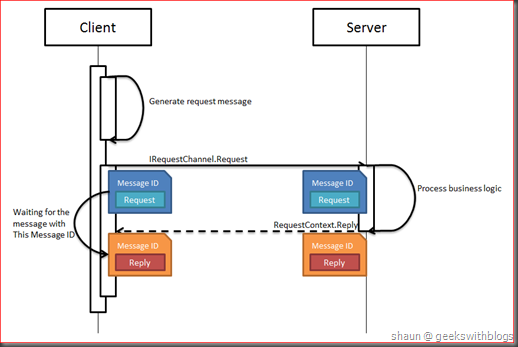 On the server side, the channel listener take the similar responsible as the channel factory on client side. It will create the related channel as well on the server side. The channels, in this case the client side request channel and server side reply channel, takes the responsible to receive and send proper messages from the underlying transportation, which is our message bus in this case. TextMessageEncodingBindingElement: This will help us to encode the WCF message into the plain text, which is very easy to debug and discover what the actual message is. MessageBusTransportBindingElement: This is the transport binding element which we will create later. As I’ve said, since the MessageBusTransportBindingElement is the transport binding element, it must be added at end of all others. Our MessageBusTransportBinding class inherits from the System.ServiceModel.Channels.Binding class, which is the base class for any bindings, such as basic HTTP, NET.TCP, etc.. And in the constructor we initialize the TextMessageEncodingBindingElement and MessageBusTransportBindingElement. When the WCF creates this binding it will invoke the CreateBindingElements method, and in this method we add these 2 binding elements. Highlight once again, the transport binding element, MessageBusTransportBindingElement in our example, MUST be added at the end of the list of the binding elements. Another property that must be implemented for a binding is the Scheme. If you are familiar with web development you would know that the scheme is the first part of the URL, which defines the protocol of your connection. WCF absorbs this concept and for each binding it must have a predefined scheme. Since the scheme is related with the underlying transportation, so it will be defined in the transport binding element. Hence in the binding layer we just need to return the transport binding element scheme back. Since we need to make the transport binding element to be able to operate our message bus, we also need to pass the bus instance into the binding and send to the underlying object. So the constructor need to have a parameter to accept the bus object and pass it to the transport binding element. So the constructor of our binding should be like this. OK, now we have the binding ready, the full code should be like this below and the next step is to create our own transport binding element. Determined what kind of MEP it supports, which means what kind of channels it can create. Create the relevant channel factory and channel listener based on the current MEP. Let’s implement them one by one. Firstly, we must define the scheme of this transport, at it will be the scheme of the endpoint address of all services that use our transport. In our example I would like to use “net.bus” as the scheme, so in the future the services on our transport would be using the endpoint likes “net.bus://localhost/MySameplService”. There are two generic methods we must implement to determined what kind of MEP it supports, which are the CanBuildChannelFactory<TChannel> and CanBuildChannelListener<TChannel>. We check the type parameter TChannel and based on its type value, we return true or false back. Since currently we only support request-reply mode, so it will return true only if the TChannel is IRplyChannel on the server side (CanBuildChannelListener) and IRequestChannel on the client side (CanBuildChannelFactory). Then the methods BuildChannelFactory<TChannel> and BuildChannelListener<TChannel> would be the place where we will create the proper channel instance. The BuildChannelFactory<TChannel> will create the channels on the client side, which based on the TChannel, while the BuildChannelListener<TChannel> will create the channels on the server side. Since we also need the bus object to be passed into the channel factory and channel listener we will add a private member to store it. And also the base class TransportBindingElement needs some other abstract members we must implement. These are fairly easy I don’t want to explain here, the full code of our transport binding element would be like this. The binding and the transport binding element will be created and used on both server and client. And after the transport binding element, when the channel factory and channel listener was created, our code will be split to server and client. Some of the following classes should be run on the server side while other on the client side, based on what MEP and what channel it is. 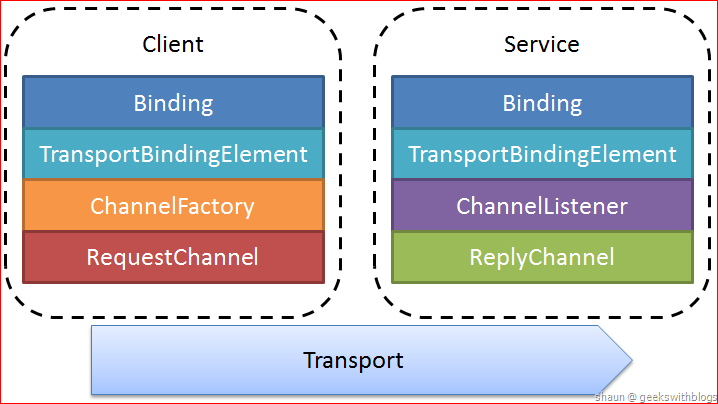 The request channel factory will be created by the transport binding element, if the current channel is IRequestChannl on the client side. It inherits from the base class ChannelFactoryBase<IRequestChannel> and has only one responsibility: create the request channel. Besides this main responsibility we also need some extra work to make our life easy. Since the underlying channel will communicate with the actual bus, we need the MessageEncoderFactory and BufferManager to read, write, encode and decode the message. These objects can be created from our encoder binding element. The MessageVersion property defines which SOAP version and addressing version we are going to use in our transport. Just use the default value would be OK. In order to make the inner channel could be able to use the message bus, we also need to pass the bus object from the transport binding element. So the full code of our RequestChannlFactory would be like this. Now we have entered the last thing on the client side, the request channel. As the lowest level in the transport structure, the channel should send and receive the actual message to the actual transportation, which is our message bus in this case. All channels are inherited from ChannelBase class, and implement the related channel interface. Since we are going to implement our request channel, so it should be inherited from the ChannelBase and the IRequestChannel. The ChannelBase abstract class need us to implement some abstract methods, which will be invoked when the channel is opened, closed and abort. In order to make our sample clear I just implement a blank OnOpen method, which will be invoked when the channel is opened but do nothing. The IRequestChannel defines all operations to send a request message from the client to server. In order to initialize the WCF message, add the message into the bus. So we will add some private members to helps us to operate the message. Then what we need to do is to implement the two Request methods, one with a timeout parameter the other isn’t. The method without the timeout parameter could be just invoking the other one with the default send timeout value. For the other method, this is where we need to send the client request message, which comes from the method parameter, into the message bus. First of all we’d better check if the current channel is available and opened. Just invoke a based method. Unbox the WCF message and convert it into string, which can be sent into out message bus. Send the message into bus. Wait for the reply message comes from the server side. Box the message into WCF message format and return back. Since we are using in memory bus, in fact we don’t need to convert the WCF message into string. We can send the message object directly into the bus. But in a real distributed scenario we cannot do this as the server are client are in different machine. So I’m converting them to string and show how to use the buffer manager and encoder to conversion between string and WCF message. We can simply get the content of a WCF message by using its ToString() method, but this is not the best way. In WCF when we need to do the message encoding and decoding, we must use the MessageEncoder, which passed from our binding, and leverage the BufferManager to maximize performance and memory usage. If we go back to the constructor of our channel class you can see we had created the proper encoder from the parameter. So in the Request method we will use this encoder and the buffer manager to read the message and convert it into string. For more information about the encoder and the buffer manager please have a look on the MSDN documents here and here. Now we have the message content, then we can send it into the message bus by using the bus object that passed from the constructor. Since the request channel is located on the client side, when invoke the send method of the bus we should tell it this is come from client. And currently we don’t need to tell the server side where the request message come from, so we will leave the last parameter as null. The SendRequest method will add the message into bus and get a unique ID back. Then the request channel will wait for the reply message, which takes this ID, back into the bus. This unique ID ensure that only this client can receive its own reply message. This is very importance if we have multiple clients are communicating with the same server. Finally, when the request channel received the related reply message, we will use the similar way to create the WCF message based on the content and return back. Now we had finished all classes and operations on the client side to send the request message and wait for the reply message. The full code of the request channel would be like this. In the previous section we finished all stuff on the client side to send a request message to the message bus, and wait for the reply message. On the server side, the binding element will create a channel listener based on the MEP currently used, and create a related reply channel to receive the incoming request message and initialize a request context, which takes the responsible to send the reply message back. The channel listener is similar with the channel factory, it will initialized from the transport binding element, the BuildChannelListener<TChannel> method. The reply channel listener inherits from ChannelListenerBase<IReplyChannel>, and in order to make the underlying channel be able to use the buffer manager, encoder and bus to read and write message, we also need to pass them from the binding element, just like what we have done in the channel factory. To minimize the implementation, the channel listener only need to implement two methods: OnOpen and OnAcceptChannel. The OpOpen method will be invoked when the listener is opened and began to listen the channel requirement. In this example we don’t need to do anything. The AcceptChannel will be invoked when a channel required, and create a relevant channel object back, based on the MEP it’s. Since we are working on the request-reply mode, we need to reply a IReplyChannel, with the buffer manager, encoder passed though its parameters. So the full code of the RequestChannelListener would be like this. The OnAcceptChannel returns a MessageBusReplyChannel which implemented the IReplyChannel and inherits from the ChannelBase. Similar as the request channel, we do not need to do anything in the OnOpen method. Similar as the channel factory we get the buffer manager, encoder and bus from the upper channel listener. 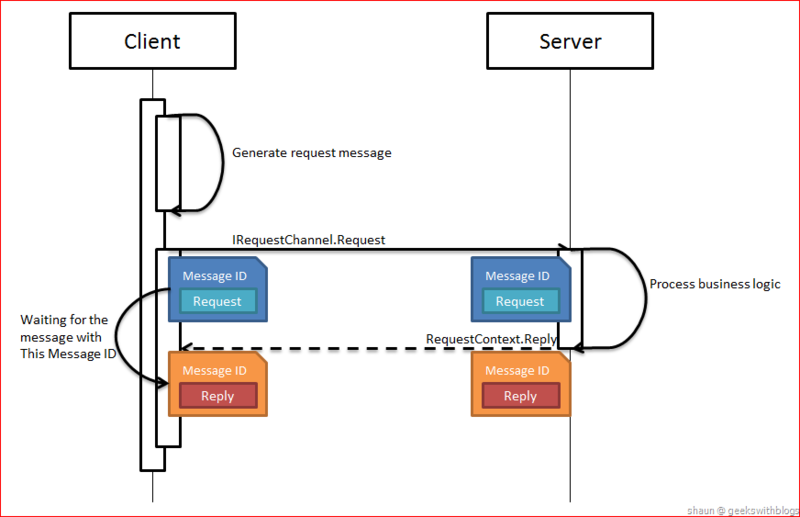 There are three methods in the IReplyChannel that related with the message receiving: WaitForRequest, ReceiveRequest(TimeSpan) and ReceiveRequest. The WaitForRequest method will return a Boolean when a request message came in, and the two ReceiveRequest read the message and return RequestContext. In our example, since our bus doesn’t support the wait for request feature, is means when receive request we will block the current thread until the request message arrive. So in this case the WaitForRequest will always return true. 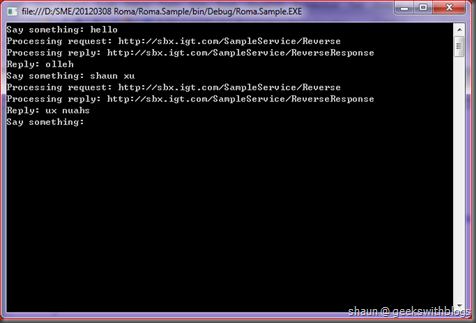 And the parameter-less ReceiveRequest method will invoke the other one with the default timeout. The other ReceiveRequest method is where we need to implement the receive operation. We will firstly check if current channel is available, and receive a message from the bus by calling the Recevie method of the IBus object. If it received a message, then will construct a new RequestContext with the message and the message ID. The WCF will take this request context and route it to the proper service, execute your business code. And your business result will be sent back to the request context wrapped into a WCF message into the Reply method. And what we need to do is to send this message into the bus. The MessageBusRequestContext inherits from RequestContext with many abstract members needs to be implement. 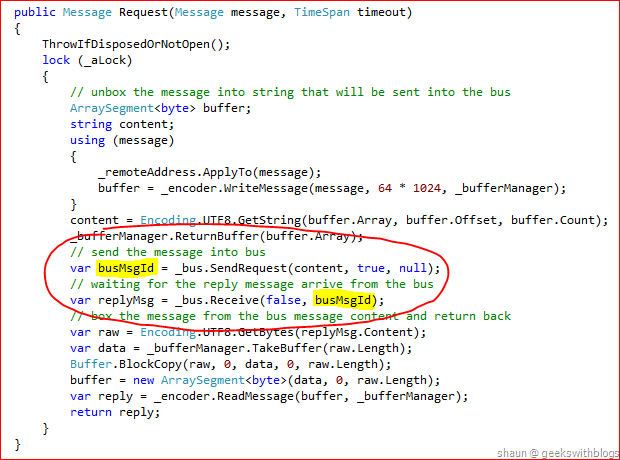 And in order to send the reply message into bus we also need the buffer manager, encoder and the bus as well. The implementation of the MessageBusRequestContext, except the Reply method would be like this. The reply message from the business logic will be come from the parameter of the Reply method. On the reply channel when we get the message what we need to do is to send the message into our message bus so that the client will receive from its IRequestChannel.Request. So firstly retrieve the content of the reply message, and then send it into message bus. One thing need to be highlight is that, our reply must be received by the client instance which sent the original request. This is not a major problem when using HTTP or TCP since the underlying connection ensure that the reply will be back to the proper client. But if we are using a message bus and assuming many clients are connecting and sending request messages over the bus, we must have some rules to make sure the reply received by the correct client. If you remembered the code that send the request message we generated a message ID. On the client side after it requested the service, the client will listen the bus only for the message that related with this ID. And on the server side, we should append this ID onto the reply message as well. The workflow on both server side and client would be like this. 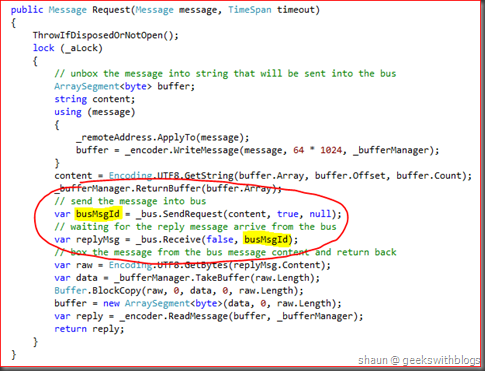 So in the RequestContent.Reply method after got the content from the WCF message we will send it to the bus, with the message ID that passed from the original incoming request message. We had finished all necessary parts so far and we can start to test our transport. But in this article I don’t want to use the normal way to establish the server and client, which means I will not use ServiceHost, ClientFactory, etc.. We are going to use the inner ChannelListener, ChannelFactory, the IRequestChannel and IReplyChannel to demonstrate what happened in WCF and our transport. Let’s create a new console application and added the references to the assembly where our transport extension is. Since we are going to use our in memory message bus, this means the server side and client side must be executed in the same process and use the same bus instance. So we will create the bus first. And then we will create the server side stuff. As we know on the server side we need initialize a ChannelListener from the binding, and retrieve a IReplyChannel through the listener’s AcceptChannel method. As you can see we also defined the service listening endpoint, which was “net.bus://localhost/sample”. The scheme of the endpoint must be the same as what we specified in the TransportBindingElement. And use the similar way we created the client side ChannelFactory and the IRequestChannel. Use the IReplyChannel.WaitForRequest to determined that a request message comes. In our sample since the thread will be blocked by the RecevieRequest method, so the WaitForRequest will always return true. 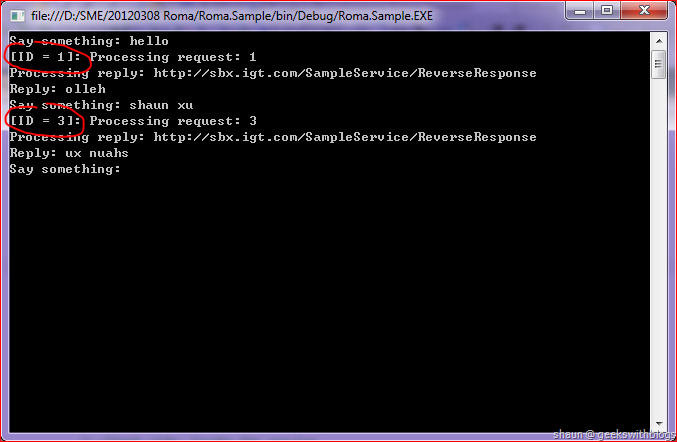 Use the IReplyChannel.ReceiveRequest to get the request message in the RequestContext format. Load the request content from the message and process the server side business logic. 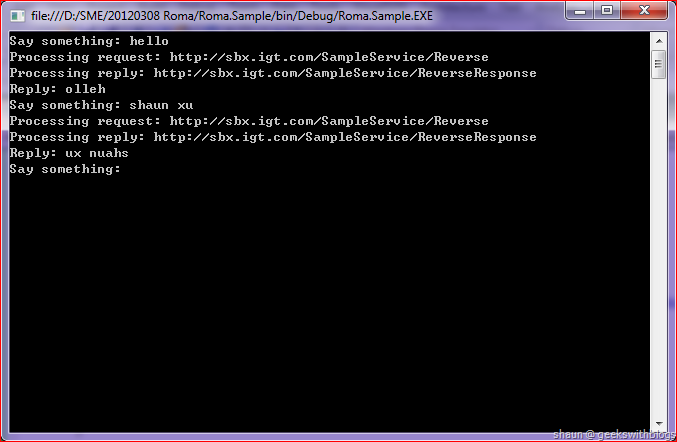 In this example the service will accept a string and reverse it. Grab the result into the reply message and invoke the RequestContext.Reply to send it back to the message bus. Back to the Main method we will create a new thread that point it this method we’d just finished and started it with the reply channel object. Next step is the client side code. We will let the user input any string from the console, wrap it into the request message and sent through the IRequestChannel.Request. It will wait for the reply message came and display the result on the screen. The full code of this console application would be like this. Let’s start the application and try to input some strings. You can see the message was sent into the message bus and received from the service code, processing the business logic and sent back to the client. But this is not our final goal. What we wanted to do is to build a transport that the same service can run multiple instances (scaling-out) listening on the same endpoint to accept the clients requests. The sample code below just ran one service instance with one client. Now let’s tweak the application a bit. I created a new method to establish a new service listener and listen on the message bus in a thread. And in the main method I initialized 3 of them in threads. And in order to show which service thread was processing the request I also tweaked the server side business logic. At this moment if we execute the application and input some strings, we can see that each service thread would be able to process the client request. 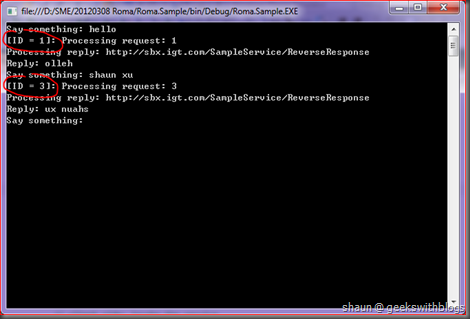 I use the service thread to simulate the multiple service instance, due to the in memory message bus limitation. If we are using some standalone message bus, such as TIBCO EMS, Redis or Windows Azure Service Bus Queues & Topics we can run the service in many processes. That would be more convictive. In this article I described how to implement WCF transport extension, in the simplest way. We created the binding, which is the root of the extension. And then the transport binding element, which is the center of the transport. And from the transport binding element, based on the MEP, client or server side we created the channel factory and channel listener. And then from the factory and listener we finally created the channels which takes the responsible to communicate with the transportation, the message bus in our case. After finished the work below we created a sample application to use the transport and message bus. We didn’t use the normal way to define the services logic, service host and client proxy. We initialize the underlying factory, listener and channels directly. And finally we simulated the scaling-out on the server side, by running multiple service code in different threads, to prove that our message bus based pulling mode architecture works. But if we review the sample application you can see that it’s not following the normal WCF pattern. Our service business logic was mixed into our service host and listening code. What we are familiar with when using WCF is to create a service contract interface and service implementation class, and then use the ServiceHost class to host it on a transport. In the next post I will show you how to modify our transport extension, so the user could be able to define and host the service in the way we are familiar with.